Why is The Aperitivo so popular in Italy? 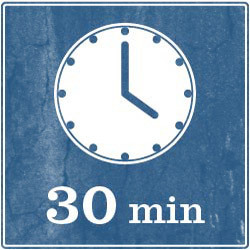 It is an easy / cheap way to get dinner and hang out with friends after work! Also consider that, in Italy, having dinner in a restaurant is, on average, more expensive than in the US (at least in San Francisco) - unless you choose a pizzeria - so it's not really common for young people to go to a restaurant. 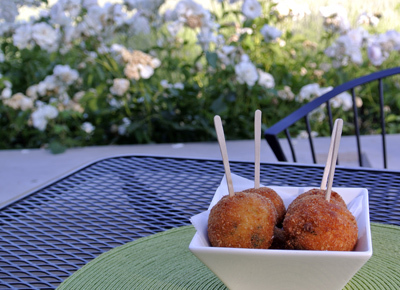 If Italian friends invite you for an aperitivo at their place, don't worry, you won't need to eat too much after it. Having an Aperitivo is a good way to have a casual dinner, usually earlier than a normal dinner and definitely less stressful than cooking a 3 course meal! 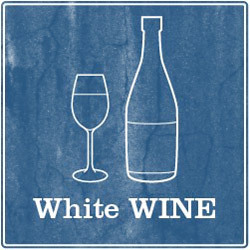 Where you can get a great Aperitivo in South bay?! Chez Tootsie's, of course! 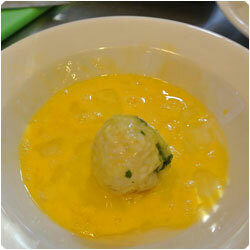 This recipe is an example of the food you can find during the Aperitivo: a classic one! 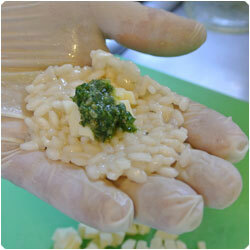 Learn how to make a simple risotto and make the Arancini filled with pesto and cheese. 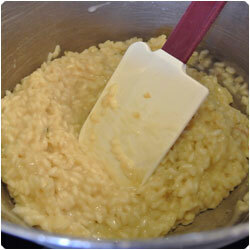 For this recipe we also took some videos that showes how Rocco made them! 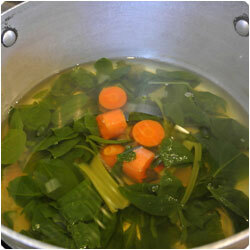 Make some vegetable broth using soup stock or fresh veggies. 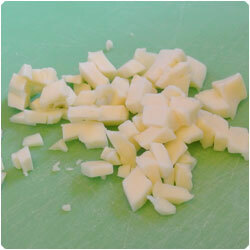 Dice the onion. 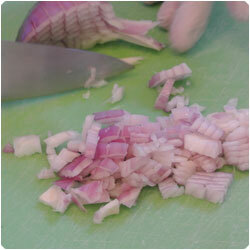 Sweat the onion with 2 tablespoons of olive oil in a pan, then add the arborio/carnaroli rice. 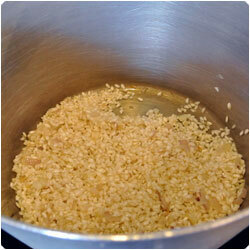 Toast the rice and when it is dry and starts to stick on the bottom of the pan add the white wine. 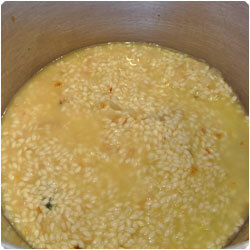 Let the wine evaporate and then add a couple of ladles of vegetable broth and bring to simmer. 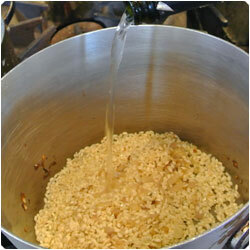 Shake the pan and stir until the broth is incorporated. 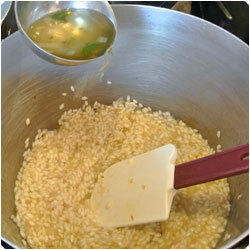 Then add the broth ladle by ladle until the rice is cooked al dente. 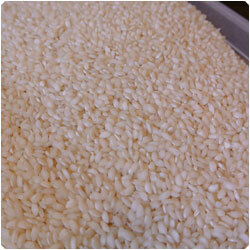 Do not overcook the rice! 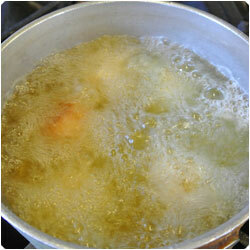 It will cook a bit also while frying! 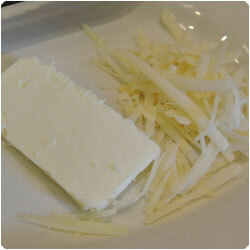 Cut a piece of butter and grater the parmesan. 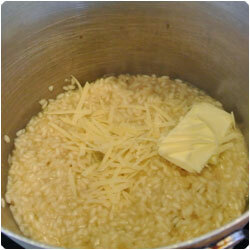 Add them in the risotto and stir. 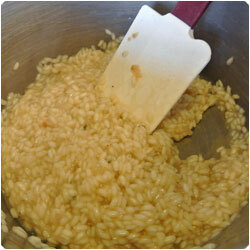 Let the risotto cool. 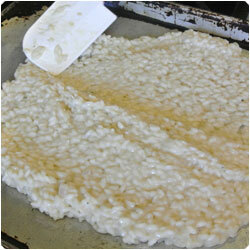 To make this process faster you can spread the risotto on a tray and leave it in the refrigerator. 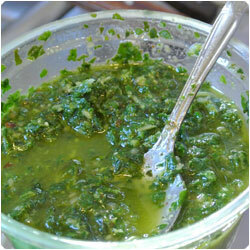 a teaspoon of pesto and with your finger close it making a ball. You should see a short video playing, to see how Rocco made it. If you don't see it, click on the video square. 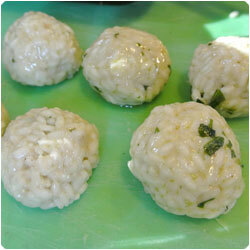 You should make about 15 arancini, they shouldn't be bigger than a golf ball. 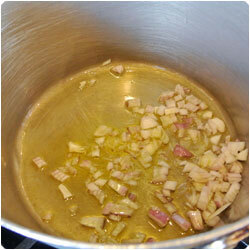 Warm up a pan with 3 fingers of vegetable oil. 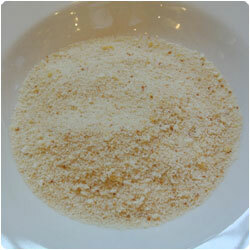 Preparein a plate the bread crumbs. 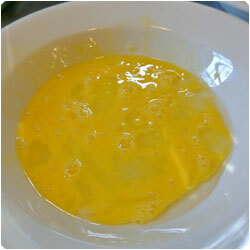 Beat one egg in another plate. 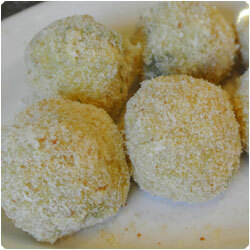 Roll each arancino in the egg and cover it with bread crumbs. 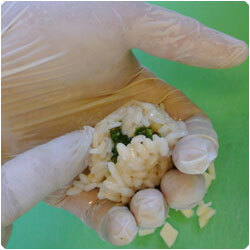 Press gently in your hand the arncini so they won't lose the ball shape while frying. You should see a short video playing, to see how Rocco made it. If you don't see it, click on the video square. 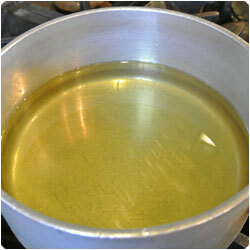 To see if the oil is warm enough put a small piece of bread and see if it frys correctly. 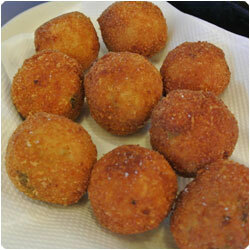 Then deep fry the arancini. 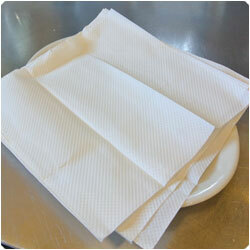 Prepare some paper towels on a plate and let they absorbe the extra oil of the arancini. 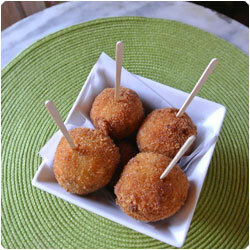 Check the arancini while frying (it won't take more that 3-5 minutes to get ready) and flip them if needed to get a uniform nice brown color. You should see a short video playing, to see how Rocco made it. If you don't see it, click on the video square. 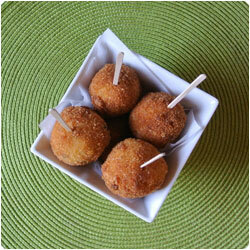 Serve the arancini warm as appetizer, better with a glass of wine!